Digital remittances, especially mobile remittances, will become increasingly important as the world embraces digital everything. 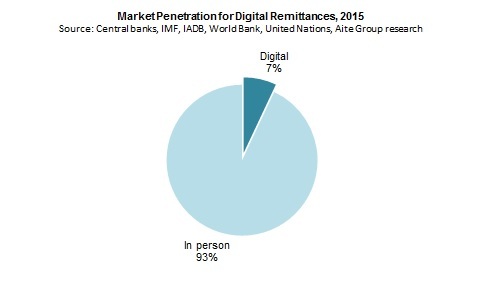 Boston, April 6, 2016 – Aite Group estimates that in 2015, just 7% of the total remittance sending volume was conducted digitally, but since most of the world’s population now has access to the Internet or mobile phones, it is just a matter of time before the scales tip to primarily digital versus in-person remittances. Innovative competitors are entering the market with alternative remittance models that send money via the Internet, mobile phones, mobile wallets, and social networks, sometimes in combination with mobile money or virtual currencies, or repurposing the remittance payment rails. These new digital business models encompass the benefits of cost, customer experience, and convenience, and are poised to put consumers back in control of their money. This report, part one of a four-part series, examines the global trends impacting the consumer cross-border remittance industry and profiles some of the companies within the industry whose business models are leading these trends: Abra, Afrimarket, Azimo, BitPesa, CurrencyFair, Fastacash, Fiserv, Flywire, Interbit, MasterCard, PayCommerce, Quippi, Regalii, Remitly, Ripple Labs, TransferTo, Terra, Visa, Western Union, WorldRemit, and Xoom. It is based on Aite Group interviews with executives from 26 leading organizations including banks, money transfer organizations, digital wallets, and payments industry technology providers from December 2015 to February 2016. This 33-page Impact Report contains seven figures and eight tables. Clients of Aite Group’s Retail Banking & Payments service can download this report.